Theresa Huntsman of Washington University in St. Louis will be presenting the UMass Amherst Classics Department’s annual Etruscan lecture on Oct. 10 at 5.00 p.m. The lecture is entitled ‘Sometimes you can take it with you: Etruscan banquets and burials.’ The lecture is open to the public and will be held in Herter Hall 301 on the campus of the University. Questions or requests for more information should be addressed to Lisa Marie Smith (lisa@classics.umass.edu). The UMass Amherst Classics Department and its Center for Etruscan Studies are delighted to announce that Etruscan Roundtable III is being held on October 10, 2013 at noon in Herter Hall 301. The topic of this year’s roundtable is “Aspects of Social Identity”. The speakers are: Theresa Huntsman, Washington University in St. Louis; Anthony Tuck, University of Massachusetts Amherst; and Rex Wallace, University of Massachusetts Amherst. For more information please contact Rex Wallace (rwallace@classics.umass.edu). Etruscan Roundtable III is scheduled for Thursday, October 10 (2013). The topic and the line-up of participants as well as particulars about time and location will be announced in September. The Classics Department of the University of Massachusetts Amherst and the Poggio Civitate Excavation are co-sponsoring an exhibit this summer at the Murlo Archaeological Museum, an antiquarium located in the Comune of Murlo and dedicated entirely to the Poggio Civitate excavation site. The exhibit is entitled “First Words: The Archaeology of Language at Poggio Civitate.” Anthony Tuck, the director of excavations at Poggio Civitate, is curating the exhibition with the assistance of Classics faculty and students at the University of Massachusetts Amherst. This exhibit will present materials recovered from the University of Massachusetts Amherst excavation site, an aristocratic Etruscan settlement of the 8th though 6th centuries BCE. Unlike most Etruscan sites, which are known mainly through their cemeteries, Poggio Civitate preserves evidence of a range of different types of monumental architecture dating to this pivotal period in Etruscan cultural development. Over many years of excavation, a number of different types of inscribed objects have been recovered from the various buildings. The First Words exhibit will present this critical body of evidence for literacy for the first time. These fragmentary texts represent the earliest known body of evidence for literacy among the indigenous populations of Italy recovered from social rather than funerary spaces. The archeological context not only provides the essential texts, but also a deeper appreciation of the manner in which evidence from Poggio Civitate helps us understand the social, political and economic forces that drive the adaptation of literacy. A companion catalog accompanies the exhibit. It presents images of the various inscribed objects, some of which are exquisitely wrought in ceramic and ivory, along with popularly accessible summaries of research on the objects and their inscriptions. The catalog also serves as a synopsis of the scholarly research reflected in the exhibit and will be available at the Murlo Archaeological Museum as well as through the College of Humanities and Fine Arts at the University of Massachusetts Amherst. First Words will be on view during the months of July and August, 2013, at the Murlo Archaeological Museum. The official opening of the exhibit is scheduled for Sunday, July 7. Congratulations to Nancy de Grummond of Florida State University. A symposium entitled “Artisans and Craft in Ancient Etruria” is being held in her honor on June 23 at Syracuse University in Florence. The organizer is Professor Laurel Taylor (Department of Art and Classics) of the University of North Carolina Asheville. For more information see art.unca.edu/symposium-honoring-nancy-de-grummond. 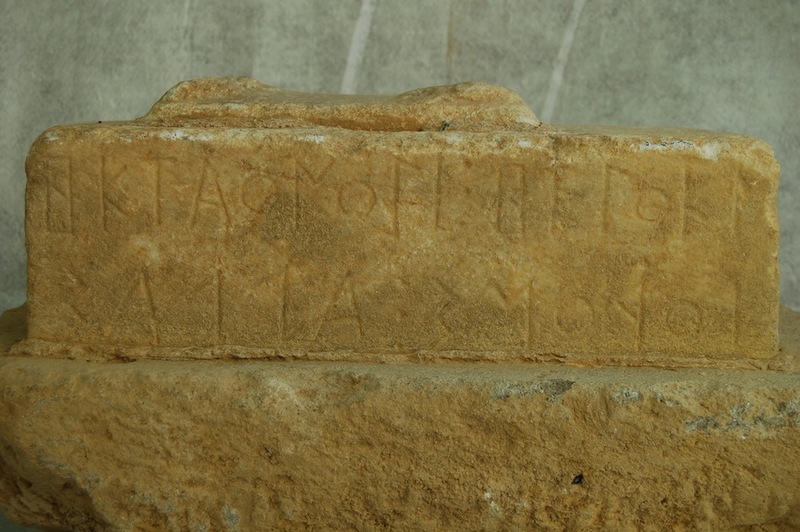 A new Lemnian inscription was discovered recently during excavation of an ancient sanctuary at Efestia on the island of Lemnos. The inscription was incised in two lines on the upper portion of a rectangular altar measuring 50 cm. in length and 13.05 cm. in height (see photograph below). The direction of writing is boustrophedon. The upper line reads from left-to-right, the lower line from right-to-left. 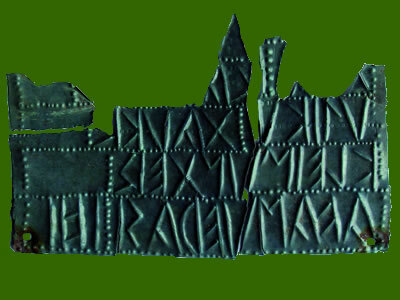 The inscription has 26 letters plus punctuation marks in the form of three vertically-aligned points separating words. The transcription provided below is that given by de Simone (2009). The letter š (= palatal sibilant) is a transcription of the Lemnian 4-bar sigma and the letter s (= dental or alveo-dental sibilant) of the Lemnian z-sign. Punctuation is indicated by a colon. 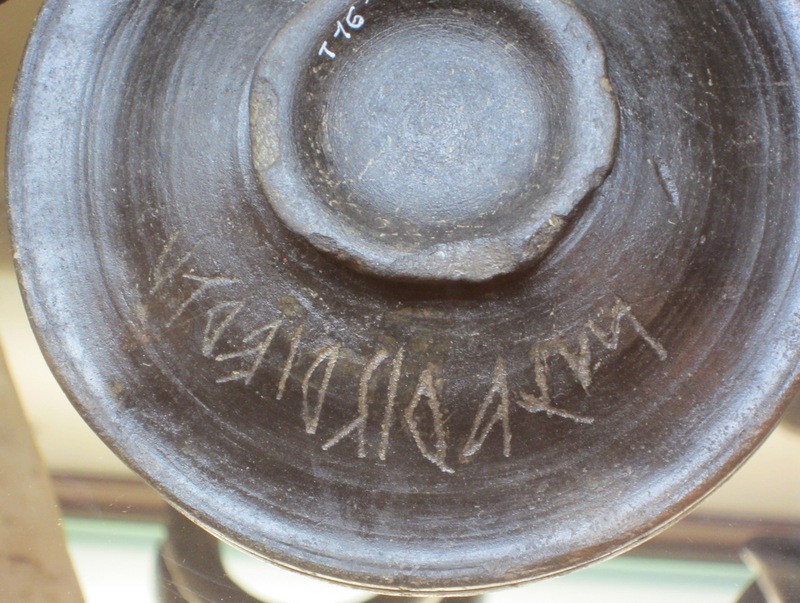 The inscription is a votive dedication offered to or, more likely, on behalf of hktaono-. hktaonosi is inflected in the pertinentive case. (Exactly how to treat the odd initial cluster hk- is not clear.) The suffix of the verb heloke matches up well with the Etruscan past tense suffix /ke/, e.g., turuce /turuke/ ‘offered’. For the construction compare Etruscan muluvanice + pertinentive. The forms in the lower line, which probably include the subject of the utterance, are problematic. The interpretative possibilities are discussed by de Simone (2009). They are: first name + family name; first name + patronymic; first name + name of object dedicated. If the direct object is topicalized then name of object dedicated + first name is also possible. But soromš and aslaš are in the uninflected form — they are not s-gentives because they end in palatal fricatives — which means that we can rule out the idea of a patronymic. Neither word has the morphology of a family name, so we can probably rule that out as well. The words may not be personal names at all. It seems reasonable to think that at least one of the words, perhaps soromš because it occupies first position, refers to an organization or institution that was responsible for setting up the dedication. aslaš could then be the name of the object dedicated. But this is all quite speculative. Background information about the date of discovery and about the archaeological context in which the altar was recovered has not yet been published. The inscription is dated on paleographic grounds to the last half of the 6th century BCE, but the date must be considered provisional until archaeological reports appear in print. de Simone, Carlo. 2009. La nuova iscrizione tirsenica di Efestia. Tripodes 11.3–58. A conference entitled “Texts, Non-Texts and Contexts: On the Varieties of Writing Experiences in the Ancient Mediterranean World” is being held at Florida State University in Tallahassee, FL on February 25-26, 2011. The conference is organized by Professor Nancy de Grummond and sponsored by the Department of Classics. For more information contact Professor Nancy de Grummond at ndegrummond@fsu.edu. 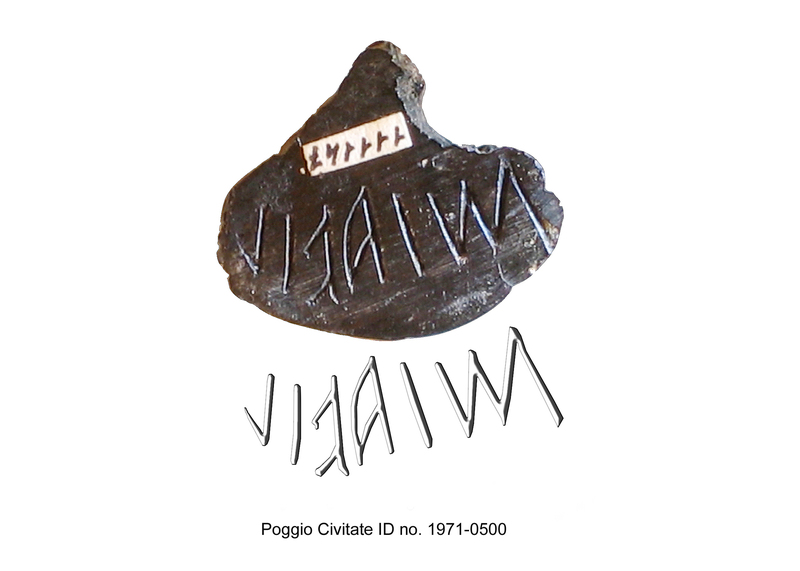 1. Letters and symbols incised on locally produced objects from Poggio Civitate (Murlo) — Anthony Tuck & Rex Wallace, Classics Department and the Center for Etruscan Studies at the University of Massachusetts Amherst. 2. 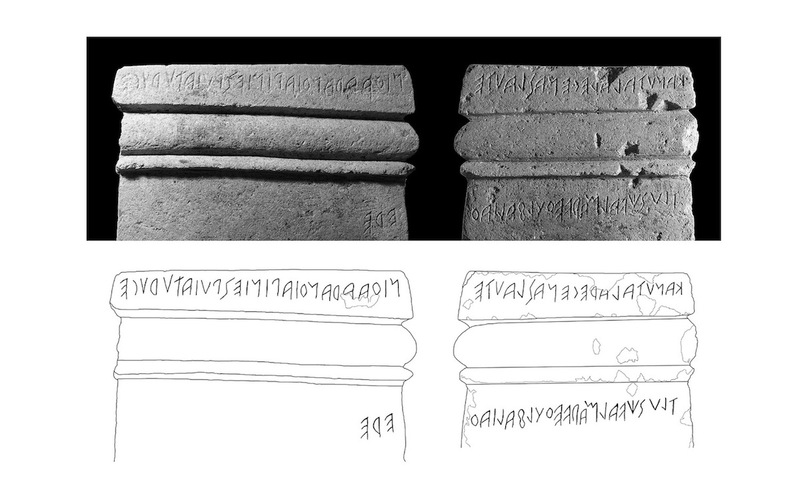 Etruscan sigla — ﻿Giovanna Bagnasco Gianni, University of Milan, & Alessandra Gobbi, University of Pavia.